What are you wintering over? Well folks, tonight is the night. Officially. IF you live in the DC Metro area and west. FREEZE WARNING TONIGHT!!! I’m sure my neighbors are so excited…between all of my plants and containers and all of Eric’s Maples, Magnolia, Paw Paws, Hickory, etc, we have a small nursery on our front driveway and back deck! Every year I go through the painstaking process of deciding what I’m going to dig out of my pots and overwinter. Ok, to be honest, it’s not that much of a decision since the answer is always EVERYTHING I think will make it! So it’s really just a matter of DOING it. And every year it ends up being more stuff. But shhh, don’t tell my family! I definitely catch some flack for “cluttering the man cave”, aka the basement. The basement (my pseudo greenhouse for the winter) is also the second part of the “guitar factory” we have going on here – first would be the garage (the other area I take over for a short amount of time). So needless to say storing ALL of my plants along with all the amps, guitars, parts and accessories, etc., well, it can get kind of crowded down there. But hey, it’s all in the name of horticulture! 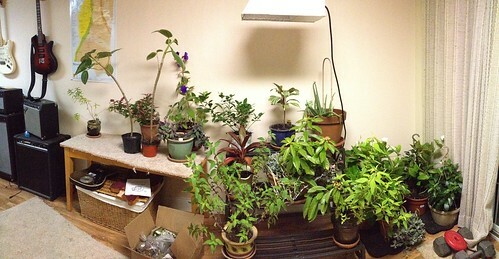 Here’s a photo of my basement (this was taken before the Ficus and Philodendrons came in, so it’s a lot more full now!). I have 2 HUGE braided ficus trees and a philodendron, 2 actually, but one’s half the size named Phil, and the other that’s pretty large and in charge named Felicia…I know, so original! These guys stay outside all summer long but come in for the winter…obviously! They take up a pretty severe amount of space and I’ve debated giving at least one ficus away. But I just can’t bring myself to do it. I’ve had them so long they’re like part of the family! So I guess we’ll just have to continue living with our small basement jungle. I have various succulents that I brought in. Unfortunately, my house doesn’t have a lot of natural light so that can make things difficult. They definitely need to go under the light in the basement and guess what happened two nights ago when I tested it…it blew! So a new one is on the way and it can’t get here soon enough! 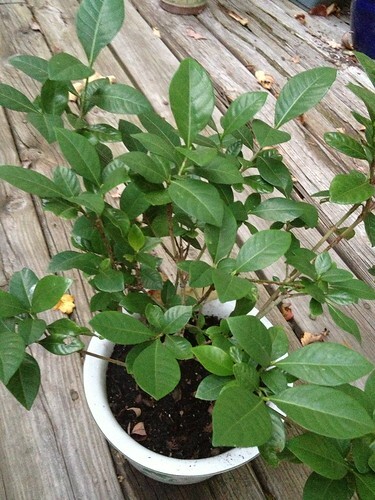 My Gardenia that my good friend Regina (who also works in the Greenhouse) gave me. I’m actually super nervous about this one. Last time I had it in the house it dropped all it’s leaves and almost died! A combo of drying out too much between waterings and not enough light I believe. It’ll have to go under the big light for sure! The thing is, I’m pretty good with the outdoor plants, but indoor stuff is tricky for me…especially in my dark house! So wish me luck on this one! 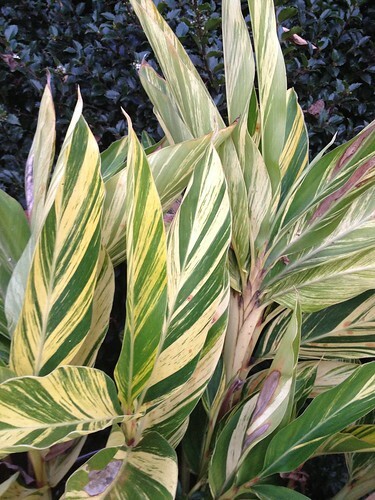 Variegated Ginger – I tried this one for the first time last year. I got the last little (actually pretty big) miscellaneous Ginger. I LOVE this plant. I don’t believe this variety is a blooming variety (at least it hasn’t bloomed for me yet anyways) but the foliage is simply amazing. Unlike the plants listed above that I let grow as normal house plants, this one I kept cut back and watered VERY sparingly last year. Once I was ready to put it outside again I watered and fertilized on a regular schedule and it came back beautifully. Oh yeah, I repotted this guy in the spring as well because it was pretty pot-bound and he really needed to stretch his legs! 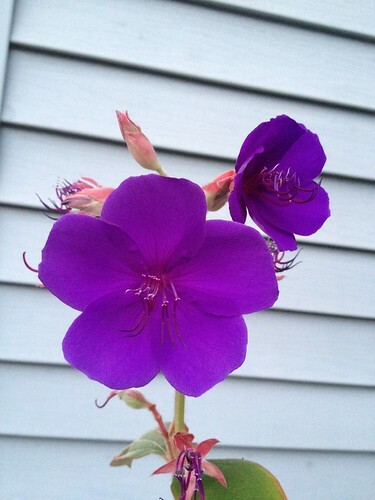 Tibouchina, a.k.a. Tibs. One of my absolute faves. 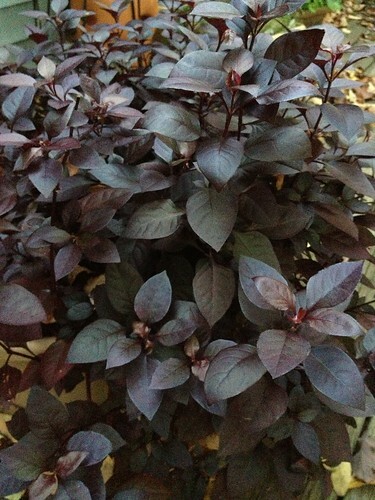 I had three of these last year (potted together in the same pot) that came through successfully. I didn’t cut these guys back like I did the Ginger but I did water very sparingly through the winter. I cut them back to a third the height when I put outside as well as repotted and fertilized. This year I have those that wintered with me last year as well as about four more! Although I’ll probably do it the same way since I had luck with that, I will be cutting off any buds and/or blooms that may be on the plant currently to conserve energy. But I haven’t been able to bring myself to do that quite yet! 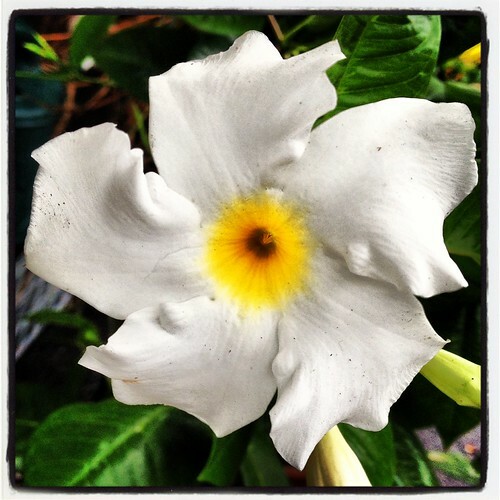 Mandevilla, another beautiful tropical! I brought two Mandevilla hanging baskets through the winter last year. A light pink one and a bright pink one. These guys didn’t worry me at all. I kept them cut back but and dry like the others, but would often have to snip a tendril. So although it really didn’t stay totally dormant, all was well and they let me know they were still here and ready to grow! And now this year I have four more white ones to add to my collection! And like the Tibs and the Ginger, I repotted and fertilized in the spring. This is in the basement of a house on the property. Here we have an assortment of Alocasia, Colocasia, Canna, Duranta, Eucalyptus, Dianella, Acalypha, Manihot and MORE! 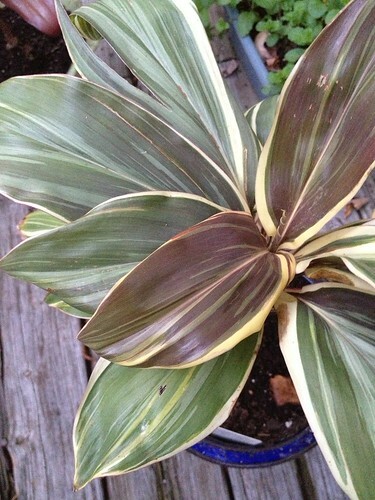 The Canna, Alacasia and Colicasia aren’t inside yet…We’re letting the frost take the foliage and then they’ll come in and stay totally dormant for the winter. Easy peasy! 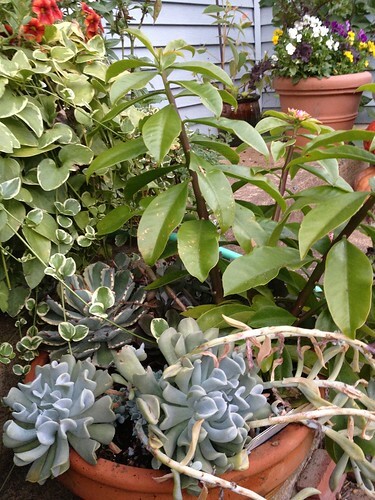 Plants typically need LESS water during the winter months. 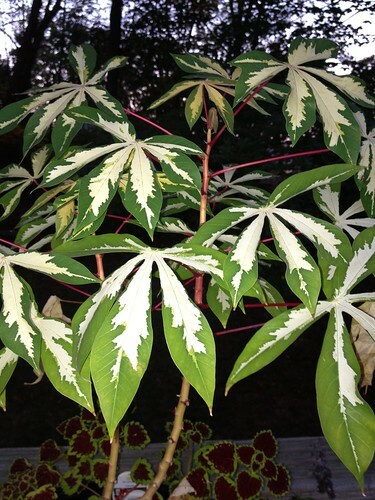 Be sure not to over water…especially those plants that are pretty much going dormant like my Ginger and Mandevilla, or if your doing any bulbs like Caladium or Canna. Last year I also tried to bring this huge pot of Lantana through. Things seemed to be going alright…it stayed cut back and dry. I watered one day, just to maintain, and must have been too much. It never recovered and rotted. It was a sad day but live and learn I guess. Make sure the plants that need light are getting enough light. Sometimes it’s difficult with these short days and the sun so much lower in the sky. If you have bright windows that’s fantastic! Or if you’re like me, you may have to get a light. Hands off the fertilizer! We aren’t trying to encourage any growth here, just trying to get these guys through the winter. Save the fertilizer for spring when we’re ready to start growing and stretching arms and legs again. So, what are YOU wintering over this year?